Wales head coach Chris Coleman is confident that his team can overturn a four point deficit in the final four games of their World Cup campaign in order to clinch an automatic qualification spot. The Euro 2016 semi-finalists were held to a 1-1 draw at Belgrade as Aaron Ramsey’s opener was equalised by Aleksandar Mitrovic, just as he did in Cardiff last November. 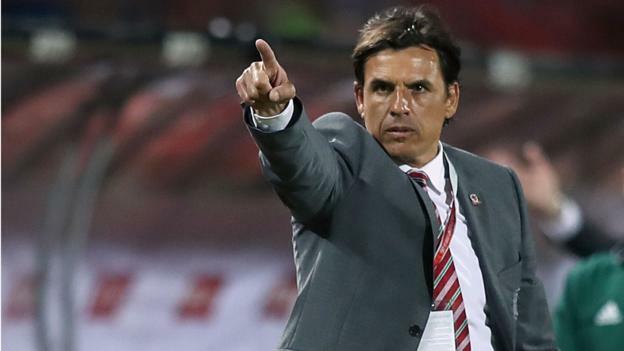 The stalemate leaves Wales four points behind both Serbia and the Republic of Ireland in the standings, but Coleman feels his side can still bridge the gap up top, he said: "I know people look at our four points with four to play... can we bridge that gap? 100% we can bridge that gap. We are looking forward to the challenges left in this campaign." Coleman’s team were without the services of Real Madrid star Gareth Bale through suspension, but Arsenal midfielder Aaron Ramsey managed to step up to clinch a vital point for his nation. Wales are currently in need of a win in almost every game, and the manager admits that victory is an absolute necessity as they enter the final round of fixtures later in the year. He added: "I think realistically if we want to finish first... four wins. If we want to take our chance in a play-off it's at least three wins and a draw. Mathematically, that's probably what we need. We're still chasing, but let's see what happens." Ramsey had produced some of his best performances for Arsenal in the dying stages of the previous season, and Coleman had a special praise for the playmaker, who converted a brilliant panenka penalty under the noisy atmosphere among the Serbian faithful. Bale will be back for Wales’ next outing in September where they take on Austria and Moldova.